Narcisco Yepes made five studio recordings of Rodrigo’s Concierto de Aranjuez and Forgotten Records has handily released the late mono and early stereo traversals of 1954 and 1957 respectively. To confuse the issue for contemporary record buyers the conductor was the same, Ataulfo Argenta, but the orchestra changed from the Madrid Chamber Orchestra in 1954 to the later Spanish National Orchestra. 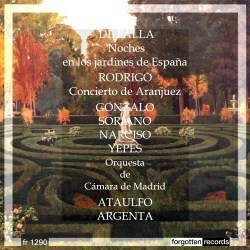 These weren’t the work’s first recordings as in the ever-complicated nature of the work’s earliest appearances on disc the Spanish National and Argenta had earlier given the premiere recording back in 1948 with Regino Sáinz de la Maza, to whom the piece was dedicated. It’s been well transferred on Chanterelle CHR004. But Yepes was for long associated with the work – given Segovia’s sulkiness and refusal to play it – that one could be forgiven for thinking he pretty much owned it in the 50s, 60s and beyond. Whichever version one has, and most will have encountered his last recordings where recorded fidelity goes hand-in-hand with greater technical burdens, his conception didn’t much alter. These two 1950s traversals are very similar indeed, as one would expect given they were made only a few years apart with the same authoritative conductor. In both there is a decent guitar/orchestra balance. Strangely, though, the balance in the slow movement between the cor anglais solo and the guitar is better in the mono. It’s watery and recessed in the stereo remake. The winds play with élan in both recordings and there is obviously significant spatial separation in the 1957 reading, where the crispness of Yepes’s articulation and chording is very much more noticeable, though in the finale he is a little less athletic than he had been in 1954. I much prefer Yepes’s playing of the Concierto to that of Julian Bream, who sounds fiddly by comparison with the Spaniard’s greater naturalness of expression. Don’t turn up the volume of the 1957 slow movement too high or you may have to tame the throbbing orchestral basses. 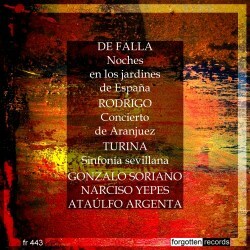 The companion work is de Falla’s Nights in the Gardens of Spain in which the same recorded history applies, as it and the Rodrigo were coupled together in both 1954 and 1957. Here though there is quite an interpretative retrenchment from Gonzalo Soriano and Argenta. It might interest admirers of the pianist, who left behind his most famous inscription for EMI in 1963 with Frübeck de Bourgos, to realise that his original conception is not dissimilar to Curzon’s 1951 Decca with Jorda but that between the mono and the stereo things tightened significantly and that each of the three movements is locked down with far greater rhythmic force in 1957. This comes as something of a surprise given the approach alters quite dramatically over a short period of years. FR443 also offers a rivetingly seductive performance of Turina’s swayingly dance-saturated Sinfonía sevillana, with a highly persuasive solo violin contribution in its central movement. This was released on the Alhambra label. The 1954 Rodrigo-Falla coupling was also issued on an Alharmbra LP, as well as on London. The stereo coupling saw service primarily on Spanish Columbia, Decca and London in the US, though The Record Society released it in Australia. The excellent transfers – no notes as usual from this company – show these two releases in the best light.